Enjoy beautiful dance in a beautiful setting, at Moving Landscapes 7: An Evening of Dance and Music on Sunday, August 17 at 7:30 pm, at the CRS Barn Studio, 2622 North Triphammer Road in Ithaca. The performance will take place rain or shine. Admission is free, with donations accepted at the door. The 7th annual Moving Landscapes performance continues the CRS Barn Studio tradition of bringing innovative dance and music partnerships to Ithaca audiences. 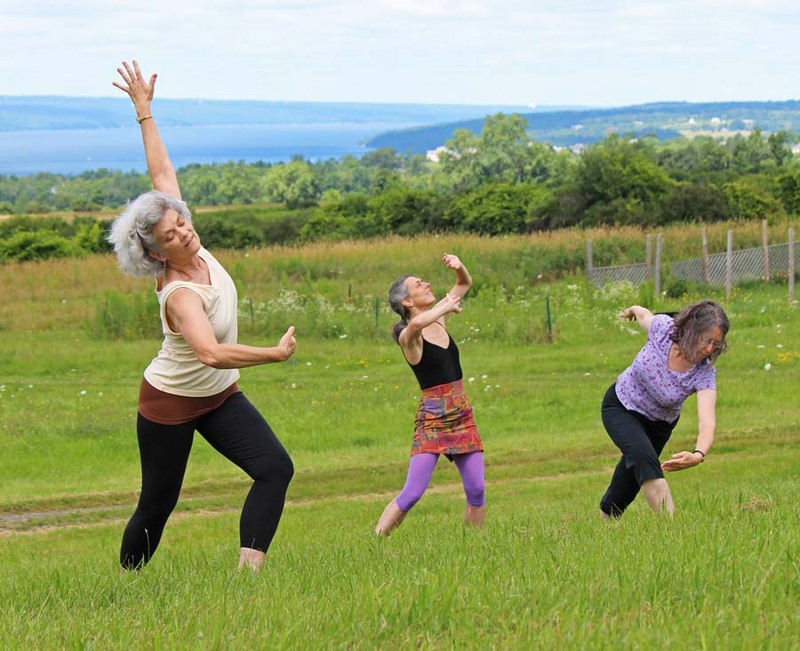 Beginning with an outdoor prologue performed in the gardens, with a panoramic view of Cayuga Lake, the evening will include choreographed pieces in a variety of dance styles, as well as music-and-dance improvisations that engage audience members in a lively creative process. This is a rare opportunity to see choreographic work in all stages of development and to observe dance-making in action, in an informal setting. Moving Landscapes 7 will showcase work by choreographers Jeanne Goddard, Donna Davenport, Tina Christina-Price, Bernadette Fiocca, Jari Poulin, and Lesley Tillotson in collaboration with dancers from the central New York area. Jeanne Goddard will premier "Dog Stories", a short comic piece choreographed by her dog, Hazelnut. Tina Christina-Price and Rik Daniels will perform two duets in contrasting moods, using both a wheelchair and a stationary chair as a basis for movement exploration, and Donna Davenport will offer her new solo, "Bound Flow". Bernadette Fiocca, Jari Poulin, and Lesley Tillotson have all created new pieces for this production. Baritone Steven Stull and pianist John White will accompany the dancers and will also perform a selection of jazz standards. A reception following the performance will offer audience members a chance to meet the artists and even offer feedback on dance works in progress.